Several distinct gameplay mechanics, such as "Charleston"
Dragons(12 tiles - 4 white dragons "Soap", 4 Green dragons, 4 red dragons). The white dragon tile on the left is also known as "Soap". Soaps can be used as zeroes when putting together certain hands. Build the Walls. 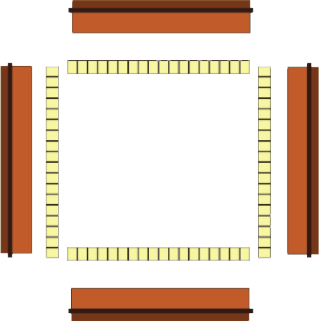 Each player builds a wall of tiles two tiles high in front of her rack as shown in the diagram below using all 152 tiles. Each wall consists of two rows of 19 tiles. Determining Who is East. Each player roles the dice in turn. 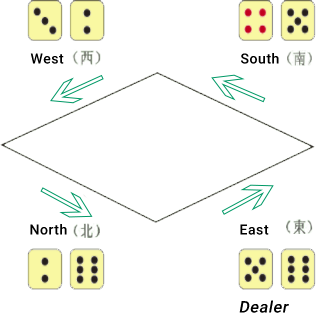 The player with the highest number becomes East (dealer). The player to her right is South, followed by West and then North. Break the Wall. East rolls the dice and then counts off the resulting number from the stack of tiles in front of her, from right to left, and breaks the wall. 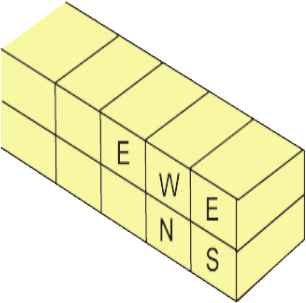 For example, if East rolls an eight, East will separate eight groups of two tiles from the right end of the wall. Then, East takes the following four tiles (two from the top row and two from the bottom row). Patterns that make up a year, such as 2010. In such case 2's, 0's, and 1's would be used. White dragons are always used as zeros. Hands that have at least one quint (5 indentical tiles) where at least one of which is a Joker. Patterns that require odd numbered tiles. Patterns requiring wind and dragon tiles. Patterns using 3's, 6's, and 9's. Patterns with single and paired tiles. Each player passes 3 unwanted tiles to the player to her right. Each player passes 3 unwanted tiles to the player opposite her. Each player passes 3 unwanted tiles to the player to her left. Each player passes 3 unwanted tiles to the player to her right, known as 'last right'. The player may blind pass these tiles. Now the excitement begins as each player tries to improve her hand. Since East has 14 tiles, she starts the game by discarding a tile. If the discarded tile is not called (claimed by other players), the turn continues to the next player on the right. The next player draws a tile from the wall. The tile is taken from where the breaking of the walls was left off. When a player draws a tile from the wall, she takes the top tile if the next tile in the stack is two tiles high, otherwise she takes the bottom tile. If the discardeed tile is not called, the turn continues to the next player on the right. The sequence of drawing, discarding, and continuing turns is repeated unless interupted by a call. Discard a tile to maintain the proper tile count in your hand. 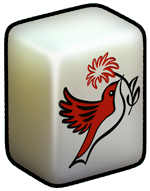 After exchanging for a joker, it is not necessary to expose tiles if that joker creates a combination in your hand. Jokers exposed in dead hands (hands that are out of the game due to violating rules), may be exchanged.